My Top Tips For Tech As Consequence – What Are Yours? After years of consulting designing and implementing business rules, I was surprised at how hard it is to enforce family rules. Something that seems so straightforward (i.e. do your homework then play video games) is not only complicated but also can be hard to enforce. 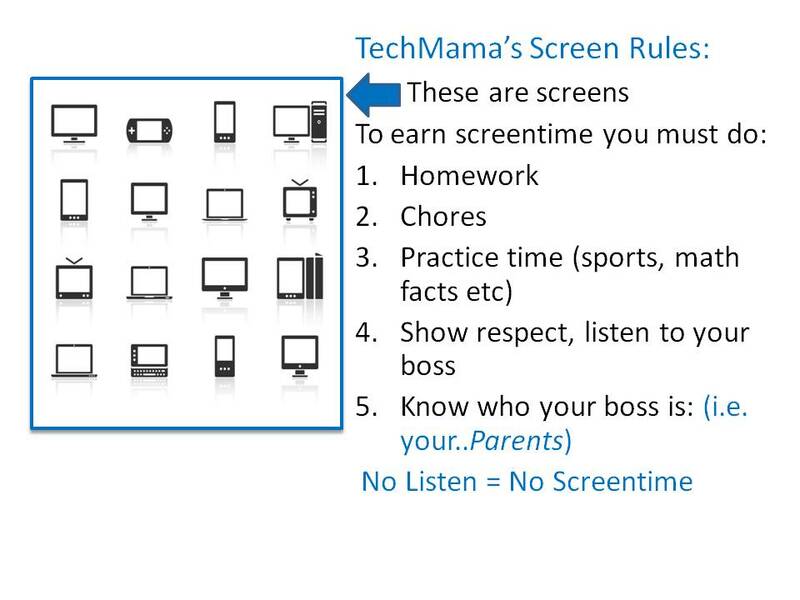 My consulting background has made it easy to develop my house rules, but enforcement of our family rules is hard. Even if I set a screen time, sometimes one of my sons wants to do his math facts by using the baseball math facts app by McGraw Hill (who also make textbooks) available on iTunes: Everyday Mathematics® Baseball Multiplication™ 1–6 and Google Play: Everyday Math BaseballMult1-12. Is that considered screen time? I wrote a post at Mashable called “Strategies for Parents: Using Tech as Consequence” where I share my tips on enforcing family rules when it comes to using tech. Do you have any tips to share? Creating written rules can be helpful to remind kids (and their parents) of the rules. I have been typing family rules on Microsoft Powerpoint for years. But just recently I saw a post by Sarah Kimmel where she shared a printout she used as a solution for her kid’s messes . Her blog, The Organized Mom, discusses tips and tricks to help families stay organized. Her solution for kids cleaning up their messes helped me realize that printing out family rules is a solution other moms are using as well. To find more tips for parents on navigating the digital world, visit Mashable Lifestyle . Along with my “Strategies for Parents: Using Tech as Consequence” are many other relevant discussions on digital dilemma’s including including “Parent’s Dilemma: Are You Raising Tech-Addicted Kids?” and “The Top 5 Things Parents Should Never Do on Facebook“. The best one that I ‘ve seen was actually an image of a note that simply said “You can have the wifi password once your chores are done”. It was in humor but really – it *could* be that simple for all of us, couldn’t it!? Down side is that then we’d all have to change the 200 iWhatevers we have in the house every single day!